For many years I had been getting increasingly tired of the constraints of slip casting and glazing and had been searching for a freer way of working. Since 2000 two events have been central to my new way of working. 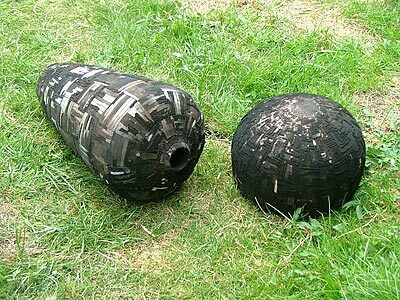 A Jane Perryman five-day course and a trip to Malawi, working with Malawian potters, changed my whole outlook and presented me with a wealth of new possibilities. I realised that all I needed was clay, a minimum of tools, a few dustbins and a variety of combustible fuels. 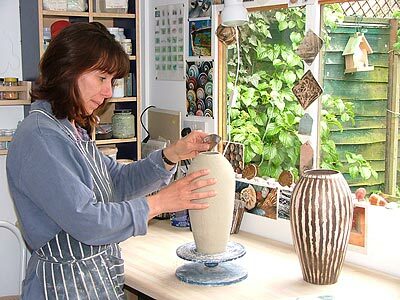 My pots are individually hand-built using coiling and slabbing to create pots, bowls or pebble shaped forms. Decoration and pattern are produced by a variety of smoke-firing techniques. I use white earthstone clay and decorate using coloured slips and body stains. The pieces are then burnished by rubbing with the back of a spoon and a piece of ‘fools’ gold to obtain a soft sheen. The work is initially fired to 950 degrees centigrade in an electric kiln. The final pattern is created by using a variety of resist techniques such as wax, tape or slip, and fired in sawdust in a metal vessel outside. The smoke from these firings impregnates the exposed clay body and creates the final surface design. The pieces are then polished with beeswax, which enhances the burnished surface. The pot forms reflect my interest in the pottery of the ancient Greeks, Celts as well as Indian and African traditional pottery today. The surfaces and colours of the pots are reminiscent of old Greek or Venetian houses with the paint peeling away whilst the patterns are acquired from the natural world around us: shells, fossils, leaves, animal skins. I trained at Wolverhampton Polytechnic and acquired a BA Hons in 3D Design, Ceramics in 1982 and have had several successful exhibitions and Gallery selections since restarting my ceramic career in 2004.